It’s been nearly three decades since Dr. Susan Lowerre-Barbieri returned from serving with the United States Peace Corps, but the experiences gained during her time in Senegal, West Africa continue to influence her research today. A 1993 graduate of the Virginia Institute of Marine Science, Lowerre-Barbieri has since 1999 held a position as a research biologist at The Fish and Wildlife Research Institute the research division of the Florida Fish and Wildlife Conservation Commission. With current research focusing on reproductive resilience in marine populations, Lowerre-Barbieri says her interest in understanding drivers of productivity started in Africa and has continued since returning to America 28 years ago. A graduate of the University of Virginia, Lowerre-Barbieri did not immediately enroll at VIMS after completing her undergraduate degree. With a deep interest in traveling and African wildlife, she joined the Peace Corps and patiently waited until there was an opening in Africa. When the opportunity finally presented itself, she packed her bags for the small village of Walli Jalla and set out to teach its people how to grow fish in the desert. As a result of not being permitted to work with the fishermen, Lowerre-Barbieri began working with the village’s aquaculture program. “Aquaculture is very interesting, but what I learned while doing that is that my true passion lies in protecting wild fish populations,” she says. 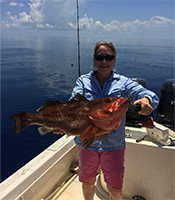 After two years in Africa, Lowerre-Barbieri returned to the U.S. and took a job with the National Marine Fisheries Service where she asked professionals in the field about the best graduate schools for marine fish population dynamics, and VIMS came highly recommended. After taking a year to write about her experiences in Senegal, she enrolled at VIMS where she bypassed her Master’s and earned her doctorate. While at VIMS, Lowerre-Barbieri also met her husband—fellow VIMS alum Luiz Barbieri. The duo shared the same advisor—Dr. Mark Chittenden—and “hit it off while chopping up fish,” she laughs. During their time at VIMS, the couple collected donations from fellow graduate students and took them to Africa to share with the people of Walli Jalla. After graduating from VIMS, Lowerre-Barbieri and her husband signed on as post-doctoral research associates at the University of Georgia on Sapelo Island where they spent four years immersed in the island’s unique Gullah culture. They started their family there, but when their oldest was close to the age for kindergarten they moved to Florida and started working for FWRI, where they continue to work today. Lowerre-Barbieri recently visited VIMS to give a seminar on one of her current research projects—assessing reproductive resilience in South Atlantic red snapper (Lutjanus campechanus)—and to attend graduate student Carissa Gervasi’s defense. As a member of Gervasi’s committee, Lowerre-Barbieri says she was impressed by Gervasi and the other students she met during her visit. While Lowerre-Barbieri’s stint in Africa was a major turning point in her life and her career as a scientist, it was also plagued by backbreaking labor, primitive living conditions, and illness. Her experiences—from the initial hardships to befriending the local women and ultimately feeling depressed when it was time to leave—are captured in her novel Under the Neem Tree.